I can never resist bird prints! 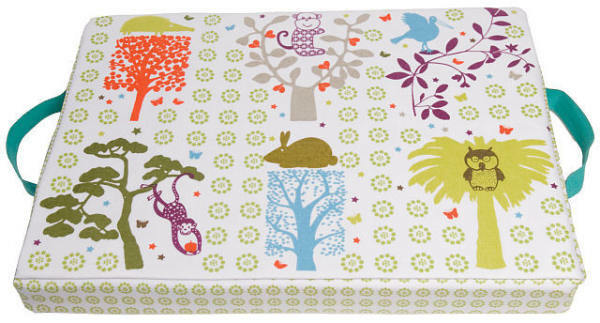 Nature themes have taken over all kinds of designer products as well as decor. Check out these chic bags from Zaza Kids – when baby is little, indulge in the gorgeous messenger baby bags. They’re lined with water-resistant fabric and are beautiful enough to use as a gym bag or general tote after baby has grown. The Zaza laminated totes come in two sizes and are ideal for older children for swimming bags, or for yourself for a lunch tote for work. Easy to keep clean just by wiping down, they’re a divine alternative to plain lunch bags! I also adore the kneeling pad! It’s easily the prettiest one I’ve ever seen and will save your knees from those hard bathroom tiles while you bathe the kids. The messenger bags are $108 each and come in four beautiful designs, the laminated totes are $29.99 for the mini, and $35.99 for the large, and the kneeling pad is $79.99 from Bubba Bling.